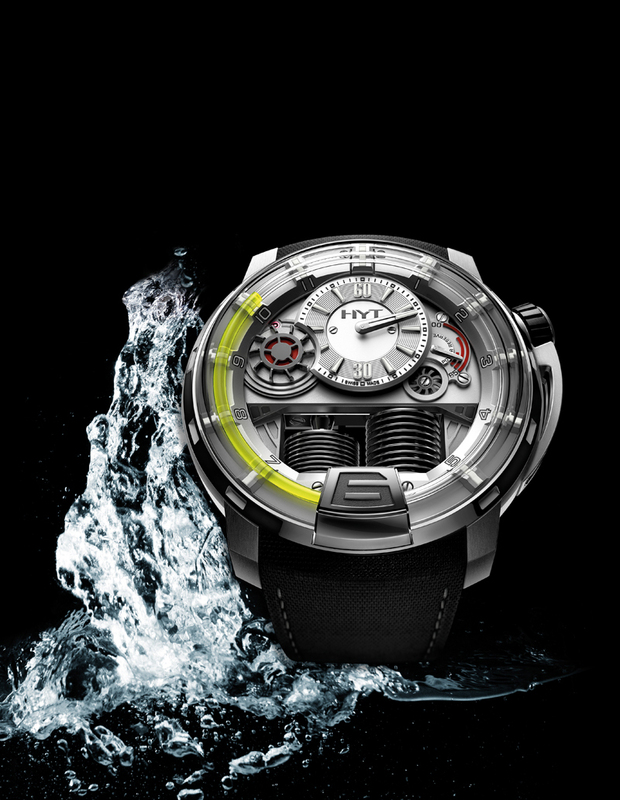 This hydro-mechanical horological merveil is the brainchild of nuclear engineer Lucien Vouillamoz, who has joined forces with some of Switzerland’s leading movers and shakers to bring his project to fruition. The team is headed up by Vincent Perriard, whom you may remember from his days as CEO at Concord and TechnoMarine. Mr Perriard gave us a first-class presentation of this new project, which, by the time you read this, will have been launched at this year’s BaselWorld. So let’s take a peek inside. The liquid module works using a mixture of green fluorescein and a transparent substance whose molecules physically won’t mix, like oil and water, creating a clear line that indicates the time. The substances photographed here are green and transparent, but the color combinations are limitless. So you could choose the colors of your national flag, red and blue if you are a New York Giants fan, or tangerine tango and cockatoo turquoise if you are a fashionisto! State-of-the-art technology enables the liquids to be pushed through a sapphire-crystal capillary at a given speed, thanks to two bellows that are powered by two pistons. This avant-garde apparatus compresses and expands to displace the liquid around the crystal capillary. The pistons are large in this first model for design purposes, but can be produced in a far smaller size to allow space for other liquid-powered complications in the future, such as a date or a power-reserve indicator. In fact, HYT is already working on a second, third and fourth collection for the years to come, thanks to some solid investors who are passionate about the project. One of the most attractive parts of this timepiece is that a mechanical movement powers all this futuristic liquid technology. This is no “off-the-shelf” movement either, as it had to be designed from scratch to allow space for the pistons at the bottom of the case. HYT called upon the services of the well-respected watchmaker Jean-François Mojon, who has done a first-class job of creating a movement to power the liquid module in true Swiss watchmaking tradition. We have heard whispers from a handful of watch companies that are also looking into liquid technology and hydraulics, so this is definitely going to be a trend to follow. But HYT has set the bar very high, and the price unexpectedly low, so it will surely be a “hyt” (excuse the pun! ).